We moved into our current home nearly fifteen years ago. Fifteen years! That’s a major chunk of time, especially for my children. My son was just two years old then. Now he is a strapping lad of seventeen! That’s almost a lifetime! Two years after we moved in, or maybe a year later, we planted a Raat ki Raani (Night Jasmine) bush in the front corner of our spacious garden. To our surprise, the bush grew with unusual rapidity. We were pleased. It had turned into a veritable rain-forest with zero encouragement on our side. So far, so good. Ah! we thought. How profusely this huge bush will flower! And the fragrance would be so prodigious! In vain we waited. The bush grew wild and had the footprint of a respectable sized UFO. After two years, we were afraid it might be taken over by aliens as a likely habitat (Who knew, after all? They were aliens!). When we asked the gardener about it, he refused to remove it entirely, begging us to give it another year to get its act together. We ordered him to slash the thing down to the barest minimum. He pruned it most reluctantly. I have no clue why he was so protective of the thing. That was the beginning of our battle. The bush and the gardener ganged up against me and my parents. The more we told the man to chop it down, the more exuberantly the bush grew! I distinctly remember one chilly Sunday morning, my father said he had had enough of it. He brought a chair into the lawn to be on hand when the gardener arrived. He intended to put the fear of God into the man and make sure the bush was dug out from the roots and the evil cast away from us forever! It had been over five years since the thing had been planted and nary a flower had it produced! My father was justifiably peeved. The gardener duly appeared. He was instructed and no argument brooked. With my dad breathing down his neck, he was compelled to cut the whole thing out. But….! The man slyly left a small nubbin of the root into the soil. There was lots of mutilated foliage strewn all over the place. Naturally, my father had no clue that once again the bush and its protector had foiled his wishes. Happily imagining ourselves to be rid of the useless weed, the very next day we brought a Neem tree home and had it planted in the same spot. The Neem was our insurance. It is a tenacious tree. We were certain that the last roots of the bush which might still have escaped detection would starve and eventually perish under the survival of the most aggressive scheme. It didn’t work that way at all. A month later, the bush was six feet tall again. The Neem looked more diminutive and consumptive. It had shrunk down smaller than it was when I had bought it. Our battle with the bush began all over again. We would cut off all its growth today and ten days later it would be as wild as ever. The Neem survived. Blood will tell, after all. But the other flourished. It was almost like watching a pedigree dog languishing while a mongrel from the street grew massive and powerful. In two years, the Neem grew to be a slim and dainty tree endowed with supple, fluid grace. Its leaves shone delicately in the sun. Its branches swayed languidly, waving their thin arms as if too cultured to be rudely robust. My mom had passed away. Somehow, my dad and I lost the will to combat the bush. 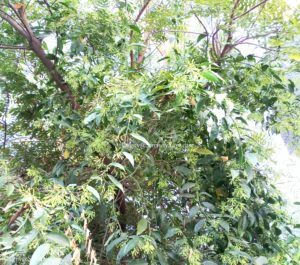 It wove itself into the branches of the Neem and became inseparable from it. There was no way to extricate the mongrel from the pedigree. By this time, we had given up all hope of the thing ever giving us any joy. But we were tired of fighting it. It had defeated us at last. That year, it grew over ten feet tall. As tall, in fact, as the Neem was. And that year, with nothing left to prove, it flowered with an abundance that left us nothing to say. People passing by our house stopped and drew deep breaths of blissful delight. 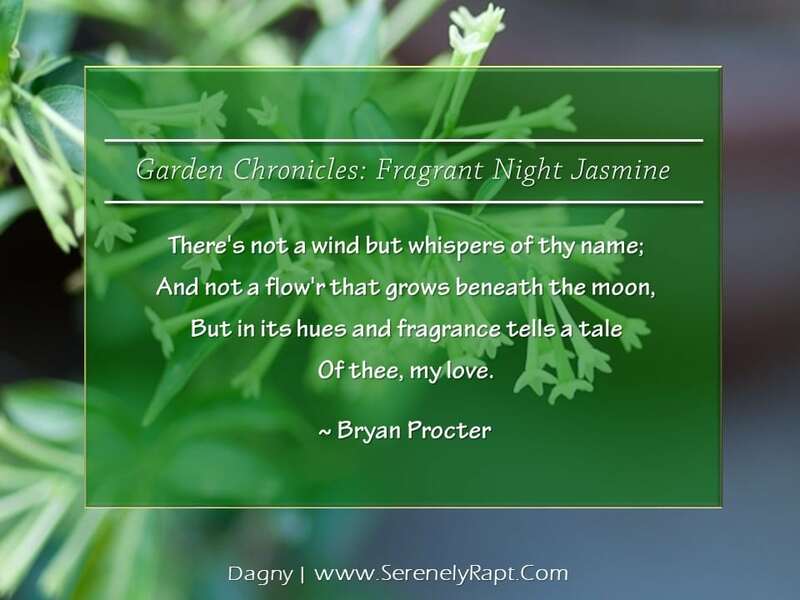 The entire lane was awash with the intoxicating fragrance emanating from the sprays of the tender white blooms of that Night Jasmine bush… the things we had called a weed. Today, that bush is tall enough to reach the second floor of the house. 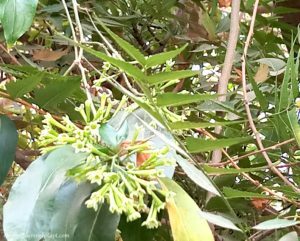 People are amazed to see a Neem tree produce masses of such fragrant flowers. They are no longer two separate entities, the Neem and the Night Jasmine. That’s one of the lesser mysteries about the duo. The other has to be the incongruousness of them co-existing. The one bitter, the other completely sweet. The tenacious, undefeatable bush throws out its enchanting flowerets twice a year, every year. As I sit typing these words, its fragrance has stolen into my room and is driving me delirious. I sit wrapped in its heady bouquet, as beautiful to me as the memory of a distant love. To think I almost lost this enriching experience! On the other hand, perhaps I wasn’t meant to lose it. Of course, you were meant to bask and glory in the fragrance, which is why all your efforts to weed it out failed miserably. And bless that old gardener of yours! But more importantly, the Raat ki raani knew there was an inmate in the house who shared her tenacity and strength and will to not just thrive, but flourish! The new home and look are simply awesome. The homepage is so neat and sorted, just like your work! I am sorry it took me this long to come by. You always make me feel so good about myself Zephyr. I wish I was as consistently tough and tenacious as you give me credit for. I guess neither you nor I would have come this far if we were not strong like most Indian women are. I know you too have gone through hair-raising times! I guessed which phrase it was! 😀 Haha… you would note the phrase. You knew who it was for!